The male seahorse tops our list and here's why: not only is he monogamous, but this creature is actually the one who gets pregnant, carrying up to 1,000 babies at a time! The mating process begins with a dancing courtship ritual of sorts with the female eventually laying hundreds of eggs inside the male, which he then helps fertilize himself during the process. This papa-to-be also loves to show off his rounded belly, proudly displaying the brood pouch he uses for carrying his young. 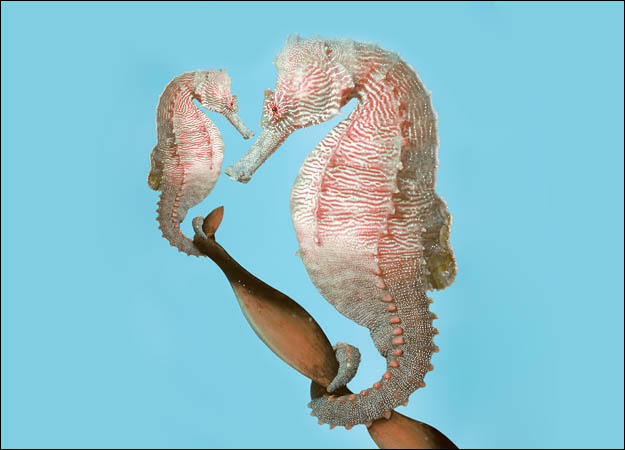 However, before anyone nominates the male seahorse for Father of the Year, you might want to hold your horses (pun intended) — this dad has been known to eat a few of his offspring as well. Hey, nobody's perfect!